Native fish in the lower Broken Creek proved remarkably resilient to a dry winter, low oxygen levels and azolla and blue-green algal outbreaks during 2015–16. The Broken Creek's flows have been significantly altered over the past 100 years by the extraction of water for households, industry and farming. Rather than the creek having naturally low or no flows during summer and autumn, its water levels are maintained to supply water for irrigation, domestic and stock use. In winter, water levels would be higher under natural conditions but flows are now reduced as the irrigation season comes to an end. Given the regulated flow pattern, in order to improve water quality and habitat for native fish and waterbugs, environmental watering is timed to piggyback on water delivered for irrigation, domestic and stock uses between August and May. "2015–16 was particularly dry and long stretches of the creek below Nathalia were blanketed by azolla, a small aquatic floating fern. It can form a dense carpet and block sunlight and oxygen from reaching aquatic plants, fish and other aquatic wildlife," said Goulburn Broken Catchment Management Authority's (CMA) Simon Casanelia. "Water from the Goulburn water quality allowance, which is water specifically set aside for maintaining water quality in the Goulburn River, was delivered along the creek in August 2015 to help dilute and flush connected channels. This had the added benefit of flushing azolla through the system." Low allocations and the dry spring and summer led to high temperatures which, coupled with a blue-green algal bloom, resulted in extremely low oxygen levels at Rice's Weir near Barmah. Low oxygen levels in waterways can result in the death of fish and other aquatic species. Goulburn Broken CMA staff then implemented a careful fish rescue to move native fish out of harm's way. "To avoid fish deaths, native fish were moved from Rice's Weir and released further along the creek," Simon said. 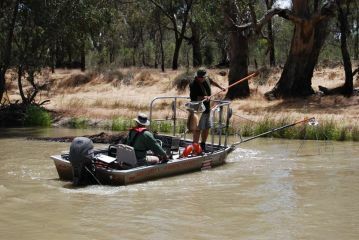 "Just 15 native fish were caught and released including 13 Murray cod and two golden perch, indicating that most fish had already moved further along the creek. The fish that were caught appeared to be in good condition, with no visible signs of stress." Fishing and boating were not affected by the blue-green algal and azolla outbreaks. Environmental watering supports recreational activities including in townships and areas of the Broken-Boosey State Park. Gavin Parkinson, secretary of the Numurkah Fishing Club, said his club is pleased to see environmental water being used in the lower Broken Creek system. "Environmental water improves water quality, gives sufficient water levels and flows to fill habitat pools and provides safe passage for fish throughout the creek and fish ladders in our local waterway. We feel this is even more important during times of low winter flows and as we approach the spring breeding season. "The use of environmental water, in conjunction with improved in-stream habitat from habitat restoration projects, has improved recreational fishing in the local area and will continue to do so in the future."